Beef Rendang is a flavorful West Sumatran dry curry that's made with beef, that's cooked together with a spice paste and coconut milk until fork-tender. It's then fried together with the remaining braising liquid until the liquid caramelizes around the beef, coating it with an insane amount of flavor. This Beef Rendang was one of the dishes I learned how to cook one rainy afternoon at Russel Wong’s home (yes, the Russel Wong from Bourdain’s Singapore espisode). His wife Judy can cook about as well as Russel can shoot a portrait, after an afternoon sweating over a wok, we were sitting down with friends to an eight course feast in Russel’s photo studio. While it was tough picking a favorite dish from that night, I found myself going back to the Rendang more than any other dish. The flavors of Beef Rendang unfold in layers, like a stick of Willy Wonka’s three-course-dinner chewing gum. First there’s the zingy flavors of lemongrass and ginger, then comes the savory beef along with a torrent of chili, finally, as you continue to chew you start tasting the creamy coconut milk towards the back of your tongue. Throughout the Rendang lesson, Judy hammered home two things: 1) Rendang is not rendang if it has a sauce 2) Rendang always tastes better the next day. That’s because Beef Rendang was originally created as a method of preserving meat. Before refrigeration was available, when wealthy Minangkabau farmers dispatched a cow for a special occasion it was often turned into Rendang. With its blistering spiciness (capsaicin is an antimicrobial), low moisture content and high fat content, Rendang provided a way to make the kill last for weeks in the sweltering Indonesian heat. 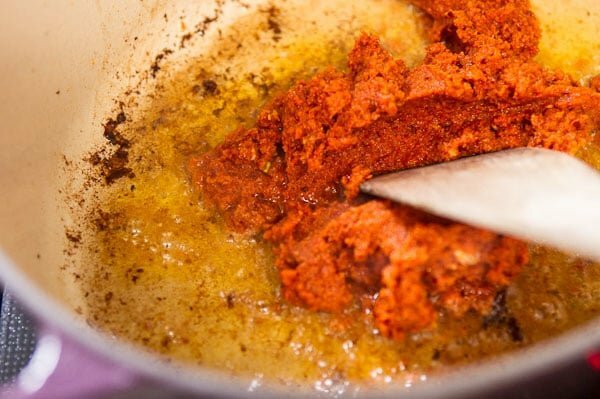 First a spice paste is fried to bring out the flavors, then the meat is braised with the spice paste and coconut milk, then after nearly all the liquid has evaporated, the remaining sauce is caramelized by frying it in the oil that the meat released during braising. 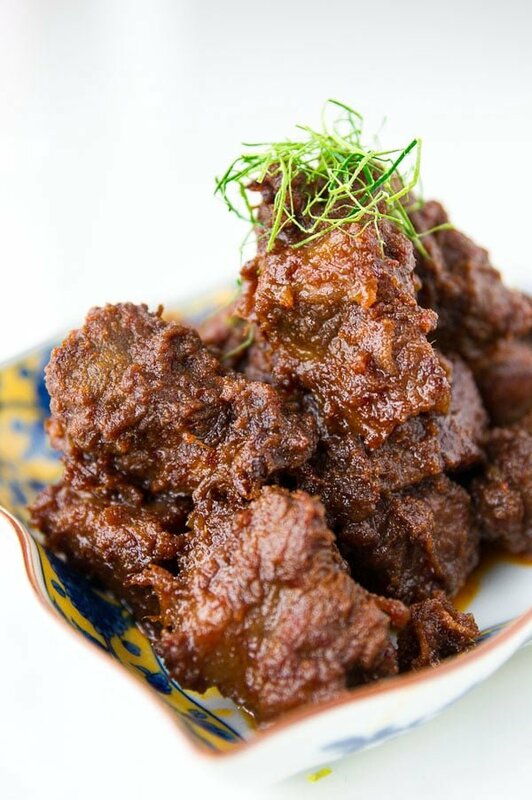 This creates an extremely flavorful coating on the outside of the beef, which eventually absorbs back into the meat, making Rendang improve in flavor over time. For those of us who aren’t lucky enough to be able to head down to a local shop and pick up fresh coconut milk (or lack the patience to grate the coconut and extract it ourselves), I’ve found a good alternative that beats the canned stuff. It’s a coconut powder created by spray drying fresh coconut milk, a process that rapidly removes the liquid preserving the flavor profile of fresh coconut milk. 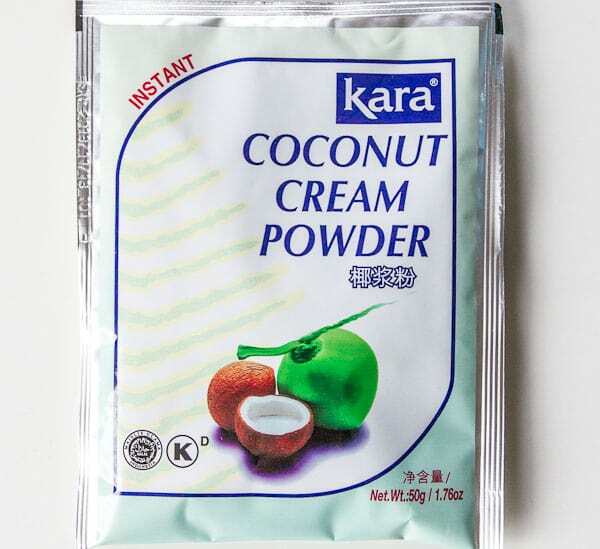 It’s sold in 50 gram packets by a company called Kara and makes about 1 cup of coconut milk per pack. 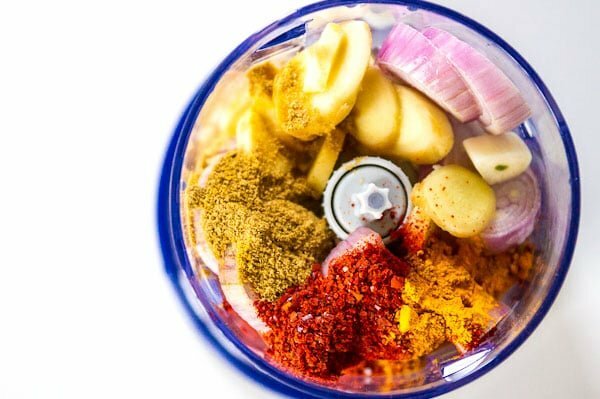 Add all the salt, coriander, turmeric, ginger, garlic, shallots, and chili flakes to a food processor and run until there are no clumps left and you have a smooth spice paste. You'll need to scape the bowl down a few times. Add the oil to a heavy bottomed pot and heat over medium high heat until shimmering. 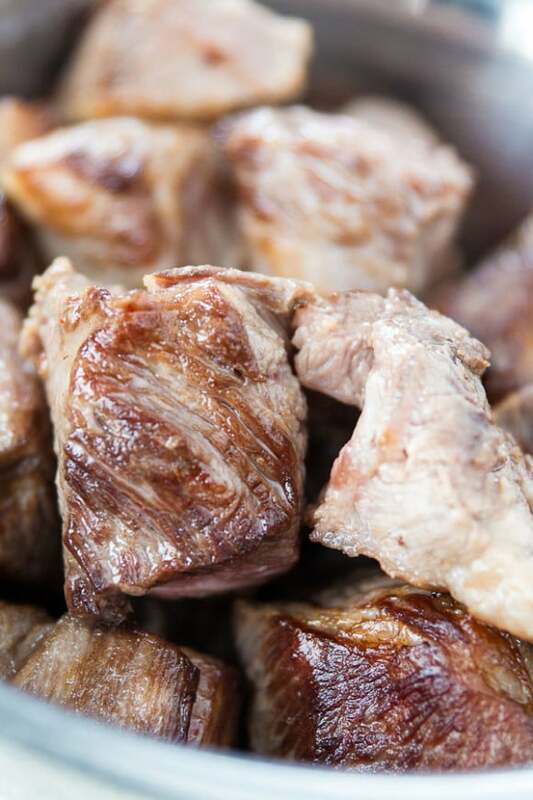 Fry the beef in batches, allowing each surface to brown before turning. Transfer the browned beef to a bowl and repeat with the remaining meat. Add the lemongrass, lime leaves and galangal to the hot oil and fry until fragrant. Transfer to the bowl with the browned beef, leaving the oil in the pot. Turn down the heat to medium low, and then add the spice paste. Fry, stirring constantly until very fragrant and most of the moisture has evaporated (about 10-15 minutes). If the paste starts burning, reduce the heat and add a bit of water. Rehydrate the coconut cream powder in 2 cups of water and then add it to the pot along with the palm sugar Return the beef and herbs to the pot, stir to combine the turn the heat down to medium low and loosely cover with a lid (you want some steam to escape). Stir the rendang periodically and simmer for 3-4 hours until the meat is very tender. Once the meat is tender and most of the liquid has evaporated (about 4 hours), remove the lid and turn up the heat.At this point there should be quite a bit of oil in the pot from the meat so you're essentially frying the sauce and concentrating the flavors.You'll need to stir the mixture constantly to prevent it from burning, but you want to evaporate as much liquid as you can without burning the meat.Keep in mind that oil does not evaporate, so you will still have a bit of oil at the bottom of the pan. The rendang is done when there is almost no sauce left and the meat is dark brown. Ideally you'll let this sit overnight for the flavors to evenly distribute into the meat. During this time, the meat will turn chocolate colored and the flavors will deepen. Serve the beef rendang with steamed rice. Your pictures are so helpful! How would you suggest we reheat it the next day to serve? I had rendang in a restaurant once and absolutely loved it, so I’ll definitely be cooking this at some point! Looks fantastic, very much looking forward to this. Looks absolutely divine. It’s been a while since I’ve visited. Hope you’ve been well. Rendang along with nasi campur are two of my most favorite Indonesian dishes. Of course, its only delicious if you eat with your bare hands! Love the marbles around the meat — tons of flavor it gives! Gently microwaving worked best for me, but you could also add some of the fat that’s settled on top into a frying pan and fry it. What a wonderful experience to learn how to make this. I’m envious! Looks delicious. Great recipe and love Rendang! Used to eat quite a bit when we lived in Singapore. I’m just about to make some batches of rendang and you posted this. You make me hungry now. If you have the opportunity to get turmeric leaves, try with them and you will discover the difference. Most rendang recipes in Indonesia don’t add palm sugar due to the add of toasted grated coconut that is pounded and in result it will release a bit sweetness to the food. Wow, wow, wow! Love the shots at different times – great idea! I will have to pinch it for a future post 😉 Even though it’s Summer here in Australia, I’m still craving this right now. Marc, this looks amazing. What a fabulous explosion of flavors here, can’t wait to try it. What about using coconut powder, like King Arthur sells, or cream of coconut instead of the coconut cream powder? Also, do you have suggestions for substitutes for hard to get items like kafir lime and galangal? Thanks so much…can’t wait to try this one soon! I saw this yesterday and I came back today to drool at the photos again. haha. Gosh I hope I’m not drooling all over this post! Marc, this dish looks and sounds phenomenal and I love the timed photo display. Let’s be friends so I can come and eat at your house! Rendang is my favorite. I made a chicken version. Your pictures want me to make it all over again!! rendangggg, my fav indonesian dish ! It’s really hard to focus on your post because it means I have to tear my eyes away from that first image. I wonder if my Asian market carries that coconut cream powder…will have to look for it on next trip. Yum, your rendang looks delicious. This looks incredible. Funny you should mention coconut powder – I was just in an Asian specialty shop in Tel Aviv and spotted that and wondered what the heck I would use it for. Now I know! I’ll have to go back and get some. So happy to have discovered your gorgeous blog. I was able to send a friend to H-Mart, near Boston. He was able To pick up galangal and lemongrass, but said the lime leaves were nasty and expensive. I was able to locate an Asian market in Nashua (35 mins south of me in NH) that carries the lime leaves (frozen). They also carry sooooo many other specialty items as well…including palm sugar! I was able to pick up more items than I need right now, but I couldn’t help myself…too good! 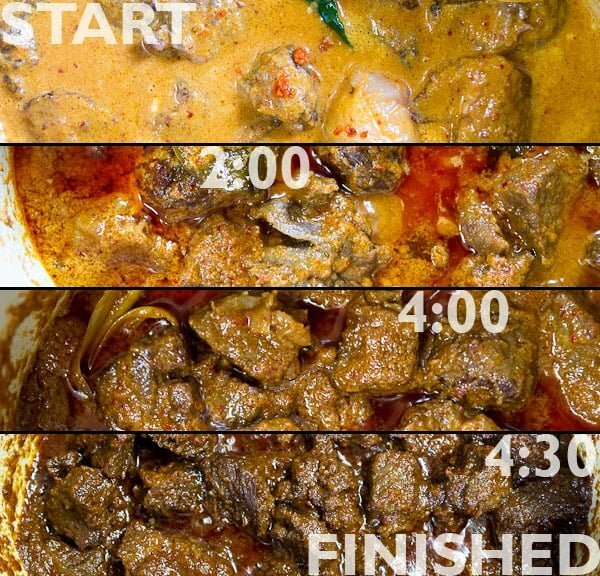 I’m making the rendang tomorrow…can’t wait. Great! Glad to hear you were able to find the ingredients and find a new shop relatively near you:-) Lemongrass and galangal both freeze well, so if you have leftovers, just slice up the galangal (it’s hard to cut fresh, imagine trying to cut it frozen) and you can either freeze the lemongrass whole or slice it really thin and freeze it (depending on how you plan on using it later). Good luck with the Rendang and let me know how it goes. Would this work for chicken as well? I am not a fan of spicy food, but the photos of this recipe looked so incredible I had to try it! My husband was absolutely thrilled and surprised I cooked this (and ate it)! It was really amazing. I find your website inspiring… And I can’t wait to work through more of your recipes through my Maternity Leave!!! I also did your chicken chili which was also spicy and great… Had to use the other white meat (ground pork) as our grocery store was out of ground birds 🙂 Thanks again!! That photomontage showing what the dish should look like at the various cooking stages is nothing short of brilliant: everybody should use it for long-drawn-out recipes like this one. I’m toying with the idea of finishing the dish, partially uncovered, in the oven and just stirring occasionally, instead of stirring every 15 minutes for hours. That’s what I did with the chicken rendang I made last week, and it was just awful good. The oven technique might be legitimate. I know most Asian kitchens don’t have an oven so the recipe never evolved that way, but perhaps it can. Since college this is my palate and plate already….its flavorful, savory, and mouth watering dish.. I made this for some friends, I substituted the chilli flakes with fresh chillies and it was lovely. When we ate it, it was heaven on our plates! We had some leftovers and had it for lunch the next day, and it tasted even more glorious. Thanks for the recipe, I will definitely be making more of this recipe! I’d love to try out this recipe! I am addicted to a Beef Rendang that is served here in a new restaurant. I want to try this recipe and am concerned about finding a few things. Where would I find Kaffir lime leaves? What is galangal? And how easy is it to find? Thanks so much for any tips you can give me on making this dish. Hi Stephanie, I don’t know where you live, so I can’t make any specific suggestions as to where to buy the ingredients. If you happen to live in NYC, you can get everything you need at Bangkok Center Grocery on Mosco Street. Otherwise you should be able to get them at an Asian grocery store (a Thai grocery store would be best). Galangal is a root that looks like ginger (but has a very different flavor). Regarding the powdered coconut cream — should we reconstitute it before adding it, and, if so, should the mixture be on the thinner or thicker side? The package suggests mixing with either 150ml or 300ml water. It’s easy for me to get powdered, and it sounds like you think it yields a better result than canned. Thanks! Hi Terri, sorry the text is a little small, the instructions on rehydrating the coconut milk powder is to the right of the ingredient. Basically you just whisk 2 packs of the powder with 2 cups of water. Thanks for the follow up . . . I was viewing on an iPhone, and just didn’t see the smaller text! Rendang is not rendang till u add tumeric leaf. If you can get hold of it, try it and u will see the difference (it just smells so good with it). Yep, the lady who showed me how to make it had a turmeric plant in her yard. Unfortunately, turmeric doesn’t grow where I live and you can’t buy the leaves anywhere. Oh my, this sounds amazing!! 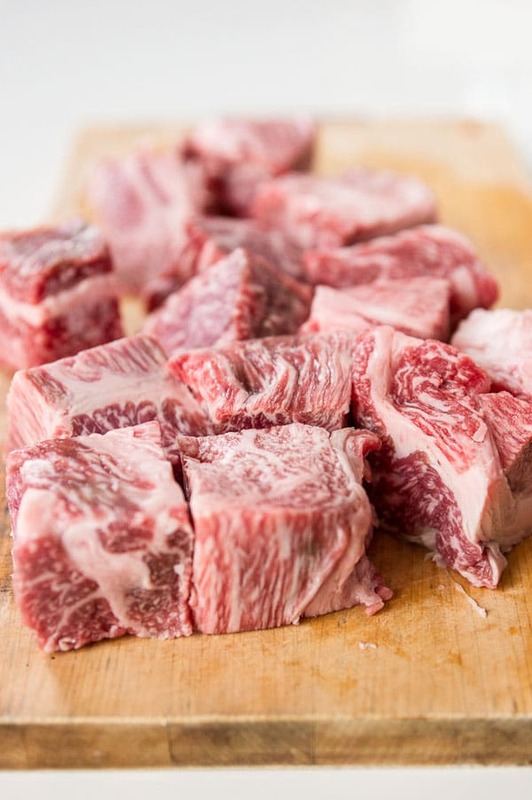 Would it be okay to use bone-in short ribs? Certainly! I recently re-made it with bone-in ribs. The bones (and their marrow) added plenty to the recipe. I asked the butcher to saw them in half so they were about 1.5″ long, and I used 25% more by weight (figuring that was about the weight of the bones). By all means dive right in and play with the recipe. Best curry I’ve ever had!